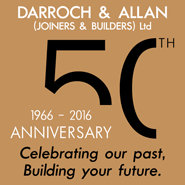 Darroch & Allan (Joiners & Builders) Ltd | Elgin, Moray. Established in 1966 and based in Elgin in Moray, Darroch & Allan (Joiners & Builders) Ltd offer a broad range of Joinery and Building services which can be tailored to meet individual client needs. In a high proportion of contracts we act as Main Contractor, co-ordinating and organising all other trades. We are an Approved Contractor for the Hambleside Danelaw Dryseal Flat Roofing System and the Sarnafil Roofing System and are one of the few approved agents for these systems in the North of Scotland. We also have plasterers and ceramic tilers in-house and welcome any enquires for works of this nature. We carry out many Private and Public Sector Contracts, including those for local distilleries, schools, hospitals and industrial premises and being a company with 50 years of valuable experience in all aspects of the construction industry feel we can offer a top quality service to a wide-ranging spectrum of clientele. This specially created website allows you to find out more about us, and the comprehensive range of construction services which we have to offer. Of those three objectives, quality always comes first!! !